South Yorkshire Fire and Rescue (SYFR) Emergency Planning Officer has received a top European Award. 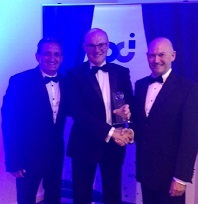 Russ Parramore attended the Business Continuity Institute (BCI) European Awards event which took place in Dublin, where he was the winner of the European Resilience and Continuity Professional (Public Sector) 2016 award. Russ joined SYFR as Emergency Planning Officer in August 2010. Over the next six years Russ took the BCI Certificate, became an Associate Member of the BCI and a Certified Lead Auditor for the BC International Standard. He has attended and hosted meetings and workshops for the BCI North East Region and spoken at the BCI World Conference for the last 2 years. Claire Platts, Policy and Technical Support Advisor at SYFR Fire Safety Central Support, was one of eight finalists in the category of European Resilience and Continuity Professional Newcomer 2016.